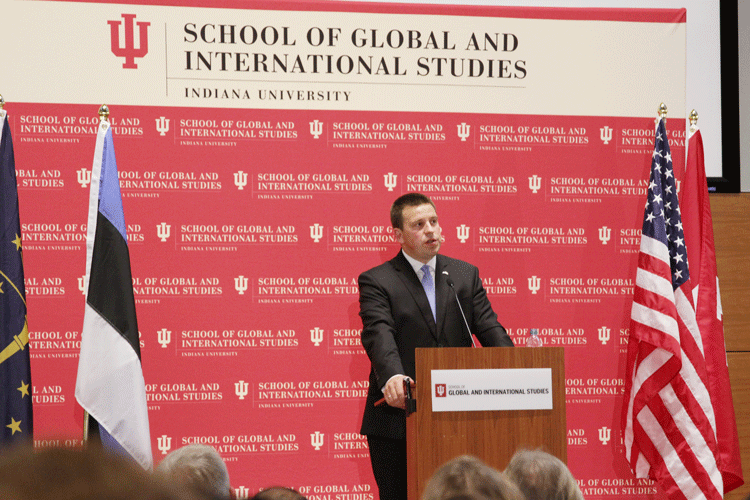 Prime Minister of the Republic of Estonia Jüri Ratas spoke to a standing-room-only audience at Indiana University’s School of Global and International Studies Tuesday, August 29. Travelling with an Estonian business delegation, the Prime Minister’s visit to Indiana included a meeting with business partners in Indianapolis as well as members of the city’s Estonian Society before the Bloomington appearance. 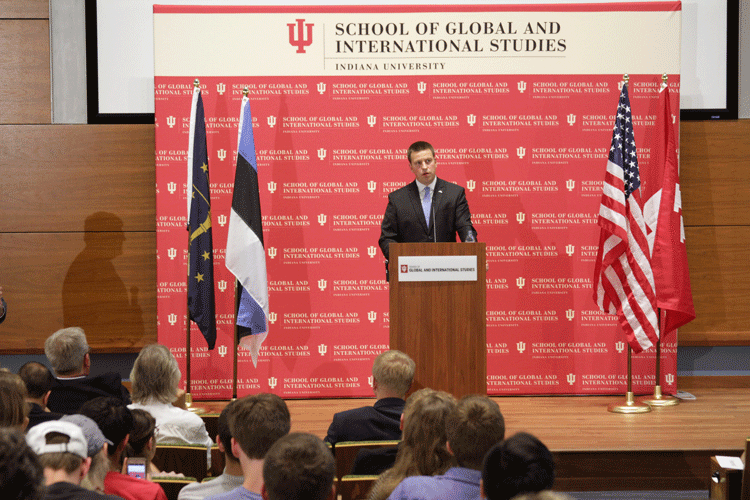 The approach of Estonia’s centennial of independence provided the occasion for Ratas’ remarks about his country’s history, its commitment to justice, democracy, and international relationships, and its current global status as a technological and political leader. Having established its independence from the Russian Empire in 1918, Estonia was annexed by the Soviet Union during World War Two. The Baltic republic restored its independence during the collapse of the Soviet regime in 1991, and became a member of the European Union and NATO in 2004. Estonia currently holds the Presidency of the Council of the European Union. The prime minister has his own personal link to the Hoosier State. Ratas was introduced to Indiana when he came to visit his cousin Ain Haas in the summer of 1994. Haas, professor emeritus of sociology at IUPUI and the chairman of the Indianapolis Estonian Society, attended Tuesday’s address. “I learned a lot about your state,” Ratas recalled. “I came to understand the true meaning of Indy 500 cars, Indiana University basketball, and of course, Reggie Miller.” Sixteen at the time, Ratas would go on to serve as president of the Estonian Basketball Association, in addition to his many political posts. The birthplace of Skype, Estonia is a hub for technology startups and is renowned for the sophistication of its cybersecurity, the digitization of its government services, and the integration of computer programming in elementary education. The prime minister made it clear, however, that Estonia’s commitment to technological advancement serves a humanist purpose. Following his Bloomington engagement, the prime minister’s itinerary proceeds with a stop in San Francisco -- to meet with members of the business community and visit the Stanford University library, renowned for its Estonian holdings -- and in Los Angeles, where Ratas is scheduled to open the West Coast Estonian Days, part of the worldwide celebration of the Estonian centennial.